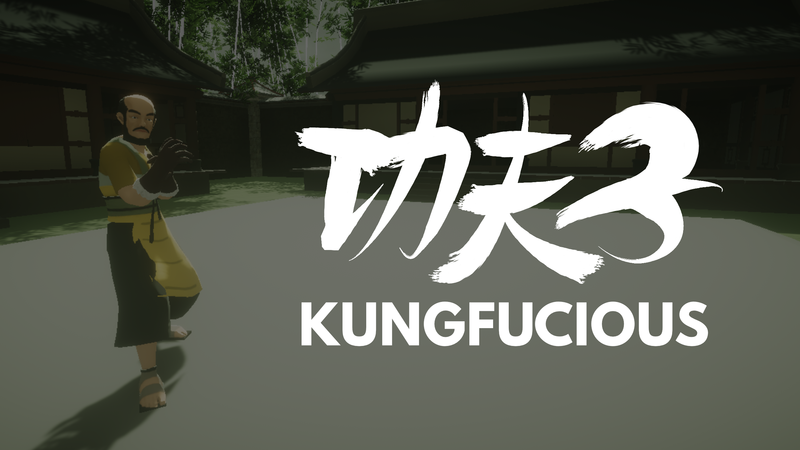 Kungfucious is a VR Kungfu Simulator/Sandbox where Violence is Virtue. Master the use of Meridian Points and Chi Skills to become the one true Kung Fu Master! This is a super early demo and is FREE to download. The demo is tested to work on Oculus Rift, Vive Headsets and Windows MR Headsets (Thanks @TA10S4 for testing this!) ! The price of the final release is to be confirmed. Donations are appreciated but do not contribute to your purchase of the game. We are not responsible for broken screens or property. MERIDIAN POINTS - Immobilize enemies and reveal their weaknesses. FOCUS TIME - Dodge or Parry attacks to activate slow-mo. CHI SKILLS - Harness the power of Chi into devastating attacks. YOU KNOW KUNG FU - Sorta. Hello when i went to install it it said i couldn't install it. Then when i looked to the side it said it wasn't available on windows, is that correct? and if it is when will it be available on windows? Wish there was a teleport option. Plus, I had to restart my game 3 times. As the first time my hands didn't appear, and the second time no enemies appeared. Gotcha! The teleport option is not mapped on Vive yet, which I'm assuming is what you use? Thanks for pointing out the bugs regarding hands and enemies. Its like being in those old classic kung fu movies.It feels like your in the matrix.If superhot was big this will be bigger.When is the full coming out ? Haha! Thanks for the compliment! We don't have a release date just yet, but wishlist the game on Steam and join us on Discord! Saw you on steam,its gonna be a hit. Thanks for the feedback! :) If you're not already on our Discord (https://discord.gg/gattaigames) consider joining! Can you play this game in the windows mixed reality? We don't have MR devices to test on, but do try it and let us know if it works! Yep! Tested and working in WMR. Love it. Already a ton of fun and without a doubt set to become the Gorn of KungFu. A couple of things with the inputs (using Touch controllers on a Rift)... I kept on opening the Menu while gripping to punch and on the few occasions I tried to drag move to sidestep. Feels like using the dedicated Oculus option button would be less prone to that (instead of one of the primary buttons). Also I couldn't get the hang of the low inverted grip, into forward punch special move. Managed to trigger the move once ot twice but the spacial movement recognition seemed either too sensitive or not intuitive enough. Again, great work. Can't wait to see how this develops. Noted on the Forward Punch move and enemy feedback!